RockeTalk for Mobile makes you share your world with your friends through FREE voice, picture and video chat from your phone. Download ringtones, games, wallpapers and videos after you preview them. Or create your own and upload them into the gallery. Participate in contests & polls and win big prizes! Join one of the vibrant communities buzzing with voices, pictures and more. Or start your own community. Meet new people using Unlimited, Free voice, video and picture chat! -Meet New People: Meet exciting new people right on your mobile phone. -Free galleries and mobile downloads: Step in to our free galleries and view amazing content posted by other users, or post your own creations. Download loads of cool stuff for your phone...ringtones, videos, wallpapers and more! -Vibrant communities: Join one of the vibrant communities buzzing with voices, pictures and more. Or start your own community. -Instant messengers: Connect to your instant messengers like Yahoo!, MSN & Google Talk! No need to stay attached to the desktop to stay connected with your friends! Qweas is providing links to RockeTalk for Mobile 6.0.2 as a courtesy, and makes no representations regarding RockeTalk for Mobile or any other applications or any information related thereto. Any questions, complaints or claims regarding this application RockeTalk for Mobile 6.0.2 must be directed to the appropriate software vendor. 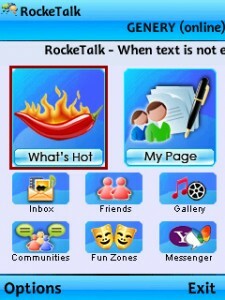 You may click the publisher link of RockeTalk for Mobile on the top of this page to get more details about the vendor.